In the future miniature sensors and drug dispensers could be implanted within the body to monitor and maintain the health of humans. These devices will be made from graphene, one of the world’s lightest and strongest materials. Graphene is made up of a single sheet of carbon atoms, connected together like razor-thin chicken wire. The material’s properties can be tweaked in numerous ways, making it a versatile material for miniature, advanced implants. However graphene is extremely stiff, while biological tissue is soft. This would result in a graphene implant suddenly heating up and frying the surrounding cells when any power is applied to make it function. Researchers from MIT and Tsinghua University in Beijing have precisely simulated the method used by electrical power to produce heat between a simple cell membrane and a single layer of graphene. Direct contact between the two layers will cause them to overheat and ultimately kill the cell. The team discovered that they could prevent this using a very thin, in-between layer of water. By tweaking the thickness of this in-between water layer, the collaborative team could carefully manipulate the quantity of heat transferred between biological tissue and graphene. They also fixed the critical power required to apply to the graphene layer, without causing the cell membrane to burn. The research findings are published in the Nature Communications journal. Co-author Zhao Qin, a research scientist in MIT’s Department of Civil and Environmental Engineering (CEE), states that simulations produced by the team could help guide the progress of graphene implants and their optimal power requirements. Usually, heat moves between two materials through vibrations in each material’s atoms. These atoms are constantly vibrating, at frequencies based on the properties of their materials. Atoms on the surface begin to vibrate even more when the heat increases, resulting in collisions with other atoms and transferring the heat in the process. The researchers were eager to accurately characterize the way heat moves, at the level of individual atoms, between the biological tissue and graphene. To perform this they considered the simplest interface, consisting of a small 500 nm-square sheet of graphene and a simple cell membrane, divided by a thin layer of water. In the body, water is everywhere, and the outer surface of membranes will always like to interact with water, so you cannot totally remove it. So we came up with a sandwich model for graphene, water, and membrane, that is a crystal clear system for seeing the thermal conductance between these two materials. 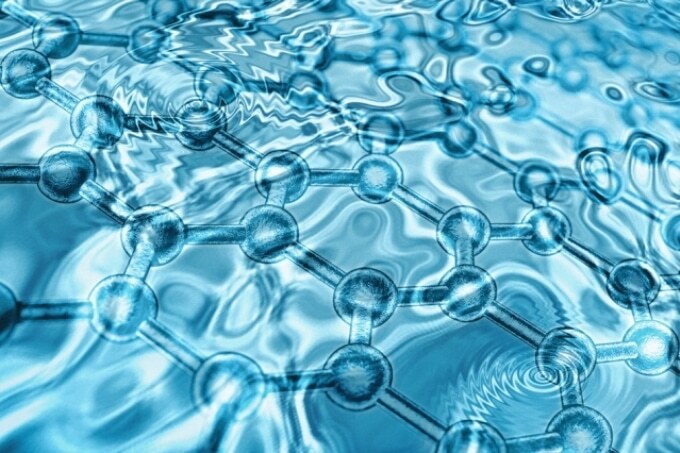 Qin’s colleagues at Tsinghua University had earlier created a model to precisely replicate the interactions between atoms in graphene and water, based on the density functional theory - a computational modeling method that considers the structure of an atom’s electrons in establishing the way that atom will relate with other atoms. However, to apply this modeling method to the team’s sandwich model, which were made up of nearly half a million atoms, would have required a huge amount of computational power. Instead, Qin and his colleagues applied classical molecular dynamics - a mathematical technique based on a “force field” potential operation, or a simplified version of the interactions between atoms - that enabled them to efficiently calculate interactions within bigger atomic systems. The researchers then constructed an atom-level sandwich model of graphene, a cell membrane and water, based on the team’s simplified force field. They performed molecular dynamics simulations where they altered the quantity of power applied to the graphene, as well as the thickness of the in-between water layer, and observed the quantity of heat that transferred over from the graphene to the cell membrane. As the stiffness of graphene and biological tissue is so diverse, Qin and his colleagues anticipated that heat would conduct quite weakly between the two materials, increasing sharply in the graphene before overflowing and overheating the cell membrane. However, the in-between water layer helped disperse this heat, easing its conduction and preventing a sharp rise in the temperature in the cell membrane. By closely observing the interactions within this interface, the researchers stumbled upon a finding: Within the sandwich model, the water - pressed against chicken-wire pattern of graphene - transformed into a similar crystal-like structure. Graphene’s lattice acts like a template to guide the water to form network structures. The water acts more like a solid material and makes the stiffness transition from graphene and membrane less abrupt. We think this helps heat to conduct from graphene to the membrane side. The team altered the thickness of the in-between water layer in simulations, and discovered that a 1 nm-wide layer of water helped to disperse heat very efficiently. In connection with the power applied to the system, they calculated that approximately a megawatt of power per meter squared, applied in small, microsecond bursts, was the most power that could be supplied to the interface without frying the cell membrane. Going forward, Qin states that implant designers can use the team’s model and simulations to establish the vital power requirements for graphene devices of varied dimensions. As for the way they might practically manipulate the thickness of the in-between water layer, he says the surface of graphene may be altered to attract a certain number of water molecules. I think graphene provides a very promising candidate for implantable devices. Our calculations can provide knowledge for designing these devices in the future, for specific applications, like sensors, monitors, and other biomedical applications. This research was partially supported by the MIT International Science and Technology Initiative (MISTI): MIT-China Seed Fund, the National Natural Science Foundation of China, DARPA, the Department of Defense (DoD) Office of Naval Research, the DoD Multidisciplinary Research Initiatives program, the MIT Energy Initiative, and the National Science Foundation.